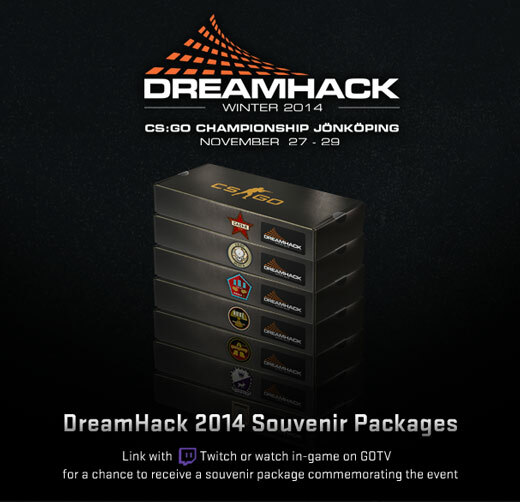 We’re just days away from The DreamHack 2014 CS:GO Championship! When you watch a match on GOTV or on Twitch with a linked account, you’ll have a chance to receive a souvenir package commemorating the event. Don’t have a linked twitch account? Head over to Twitch and follow the instructions to link your accounts. Each souvenir package contains a weapon from the collection of the map that was being played (e.g., a Dust 2 Collection weapon if the teams were playing on Dust II), with a pre-applied sticker from the two competing teams, along with a special 2014 DreamHack event sticker. There’s no wrong way to watch the DreamHack event, so choose the experience that fits your style. You can take charge over the broadcast in GOTV (all while listening to caster audio), or watch from pretty much anywhere on Twitch! Get your account linked with Twitch, and make sure your DreamHack 2014 Pick’em Challenge picks are locked and ready before the event begins!